The Truth About Collagen Drinks: Do They Work? Collagen in moisturisers doesn’t work. This pesky molecule is too big the penetrate the skin. It sits comfortably on its surface, making it soft and smooth. But firming skin or replacing the collagen it has lost? No can do. But what if you drink collagen, instead? Collagen drinks are all the rage now. (Marketers must have realised we are onto them and came up with a new tactic to sell us collagen). They make the same promises skincare with collagen did. Plumper, firmer skin and a younger-looking complexion. But can they deliver or is this just another marketing trick to get us to splurge on the latest, useless fad? Collagen is the protein that keeps skin firm and plump. It works because it’s part of a matrix that gives structure to the skin. Its job is to glue all these other substances together so your skin stays firm. When this structure loses collagen, it starts to sag and wrinkle. We start losing collagen pretty early. After we turn 21 (21, ladies! ), we lose around 1% every year. Once we hit menopause, collagen disappears at lightening speed! FIY, you’ll lose even more collagen if you live in a polluted city, eat a lot of sugar or don’t wear sunscreen daily. UV rays, pollution and sugar all destroy collagen, making your skin wrinkle and sag faster. You need to find a way to replenish the collagen your skin loses every day, but are collagen drinks the best way to do it? How Many Types Of Collagen Are There? Now, to make things more complicated, there isn’t just one type of collagen. There are about 30! Not all of them have to do with the skin. Some of these forms are only present in heart muscles, for example, so we can ignore them (for this discussion). The types of collagen that are essentials for skin’s firmness and plumpness are Types I, III, V, VI, VII, XII. I could go into more detail, but I don’t want to bore you. All you need to know is that a drink or supplement promises to firm the skin, it must promote the production of the right type of collagen. Hydrolyzed collagen: fully formed collagen chopped down into small bits. It’s the most common type used in cosmetics. Native: fully formed collagen. It has a very large molecular structure that CAN’T penetrate skin. Soluble: this is collagen that is not fully formed and is, therefore, said to penetrate skin better. It’s usually derived from young animals. WARNING! ALL collagen in skincare and drinks comes from animals, mostly fish. There are no vegetable or synthetic sources of collagen, so if you only use vegan skincare products, this is NOT for you. Does Collagen In Skincare Drinks Work? Collagen can’t get through the skin. But if you drink it, you can be sure it gets in. Now it MUST work, right? Not so fast. Just because you managed to sneak in collagen, it doesn’t mean it’s gonna do you much good. Here’s the deal: when you eat a plate of spaghetti, they don’t reach your stomach and intestines whole. They get broken down into all the smaller nutrients that make them up. It’s the same with collagen. Once the digestive process starts, collagen gets broken down into amino acids (FYI: collagen is a protein and all proteins are made up of amino acids). Your body then uses these amino acids for whatever it needs at the time. 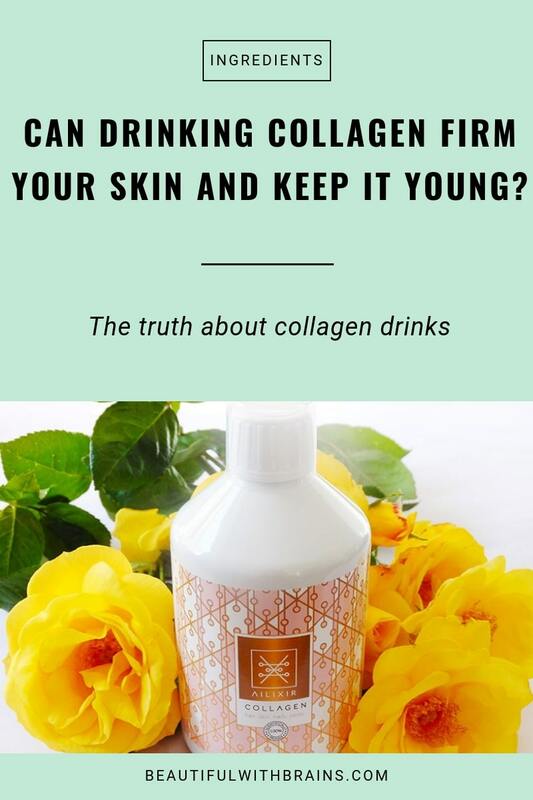 It doesn’t know you were drinking collagen to firm your skin. I believe some of these amino acids may signal your body to amp up its collagen production a bit, but it’s not a done deal. I had a hard time finding studies supporting the effectiveness of collagen drinks. Most of those claiming they work were open-lab (it means they weren’t blinded or placebo-controlled, so not the most reliable). Take for example this study done to test the effectiveness of Pure Gold Collagen, a nutritional supplements containing hydrolysed collagen, hyaluronic acid, vitamins and minerals. The study shows that these collagen fragments create more cells that produced collagen and increase the production of hyaluronic acid (essential to keep your skin plump and hydrated). I’ve found another study that’s more reliable. You know, one that was double-blind and placebo controlled. The researchers asked 69 women aged between 35-55 to receive either 2.5g or 5g of a collagen supplement or a placebo. Eight weeks later, the skin of women who had taken the supplement was more elastic than the skin of women who had taken the placebo. You can check out my post, “8 Ways To Rebuild Lost Collagen For Firmer, Younger-Looking Skin” for more information on how these treatments work and the best skincare products to rebuild your lost collagen. There is scant evidence that collagen drinks MAY help you rebuild the collagen you’ve lost. But, personally, it’s not enough to make me splurge on these expensive supplements. I’ll keep using my retinol and eating the rainbow for now. What are your thoughts on collagen drinks? Share them in the comments below. New K-Beauty Trend: Hands, Feet & Lip Masks. Do You Need Them? I recently bought powdered collagen called Lifematrix Purple Collagen, made of bovine collagen and blueberries. It claims to have 20 different antioxidants etc. I bought it for the purpose of aiding my bones, joints, skin etc. There is so much written and talked about bone broth, so I thought this may be an easier way to get the same thing! Expensive, yes, for what you get! I have no idea yet whether it is effective or not because I assume one would have to use it for several months in order to know. I see our pharmacies here in South Africa also sell collagen in capsule form, as well as Coenzyme Q10 capsules – am never totally sure if any of these are beneficial! Vivella, the supplement industry is poorly regulated so it’s hard to tell how effective these things are. I have collagen protein powder I sometimes add to my tea for health reasons, but I don’t believe it does much for my skin. At the end of the day, your body is gonna use the collagen (and antioxidants) for whatever it needs to, not necessarily to firm your skin. You can’t imagine the number of times as a community pharmacist and cosmetics formulator i have urged people to go for products that BOOST collagen synthesis like peptides, instead of anti aging products containing collagen. Collagen can have some really interesting applications, just probably not in the form we have it today. Research, as you said, is controversial at best. What little evidence there is, tends to be more in favor of oral collagen supplementation, not topical. But even then, results are not that clear. I can personally attest too, from my experience in the field, that i have seen collagen supplements work miracles in people with serious skin ailments. Most of the times however they are just a waste of money and efforts. John, I agree. I believe your body will use the collagen in some way, but you can’t tell “pop a pimple and your skin will get firmer”. Even then it depends on the supplement, what it contains, how it’s delivered…. Best to stick to retinol and other proven collagen-boosters indeed.